I was trying to understand the mood I was in when at the Donald Judd show at David Zwirner (until Saturday) because I was on the verge of tears while there. 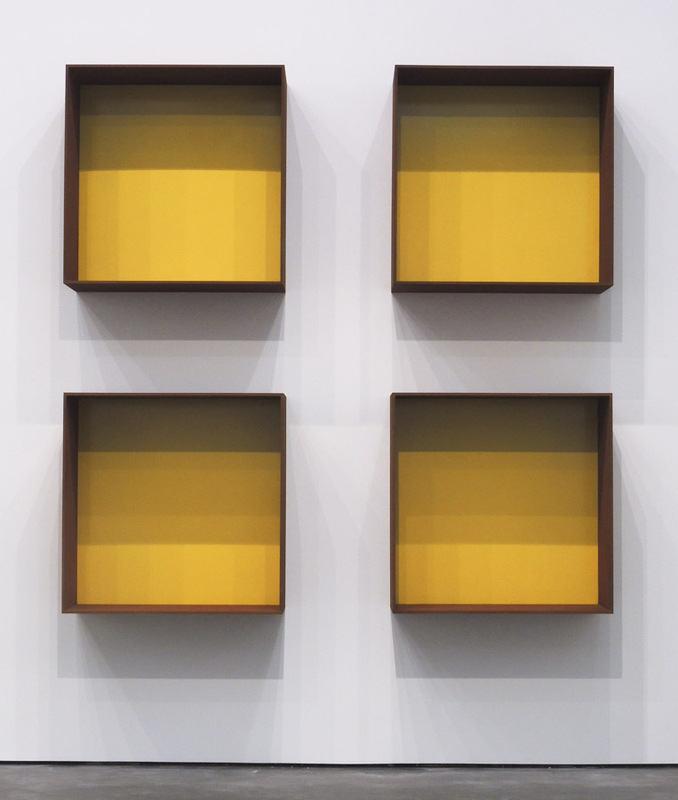 Here was work that was intensely formal––about shape and dimension and repetition and balance and weight and color––that was so beautiful in its clarity and reserve that I was deeply touched. 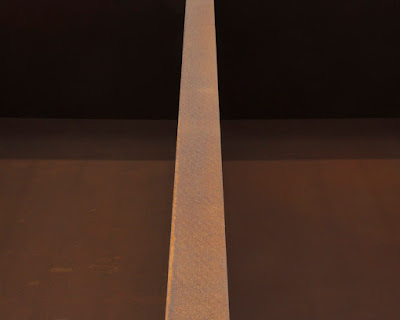 The materials of the sculpture, though industrial, are gorgeously sensuous: the Cor-ten steel has a rich orange-red surface, and the acrylic sheets capture light and reflections. There is a sense in the best minimalist art that we are seeing what is essential in the world, a perfect balance of forms that transcends materiality. 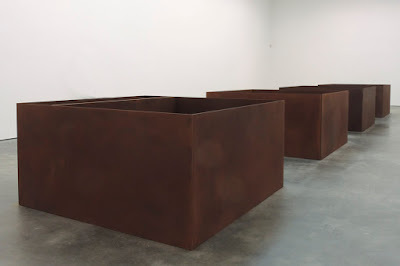 The two works above are especially moving to me; perhaps it is their square shape, and the planes within that square having a powerful presence. They have a right-ness to them, within the square and in their relationship to the space outside. 19 11/16 x 9 7/8 in. 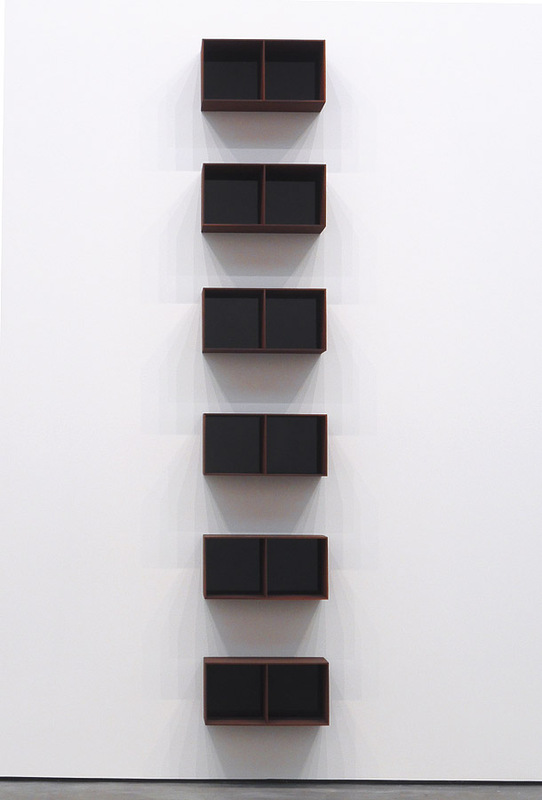 ....or these 6 going vertically up the wall. They add another formal element, that of repetition, and ask how we see differently when an object is not unique, but plays like a part of a musical composition. 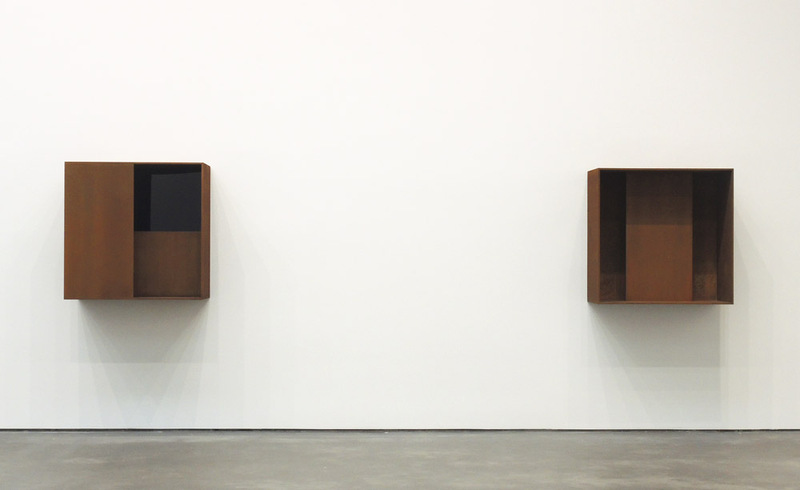 Looked at closely, these divided rectangles are richly mysterious with their dark interior planes that either sink into black or subtly reflect the room. 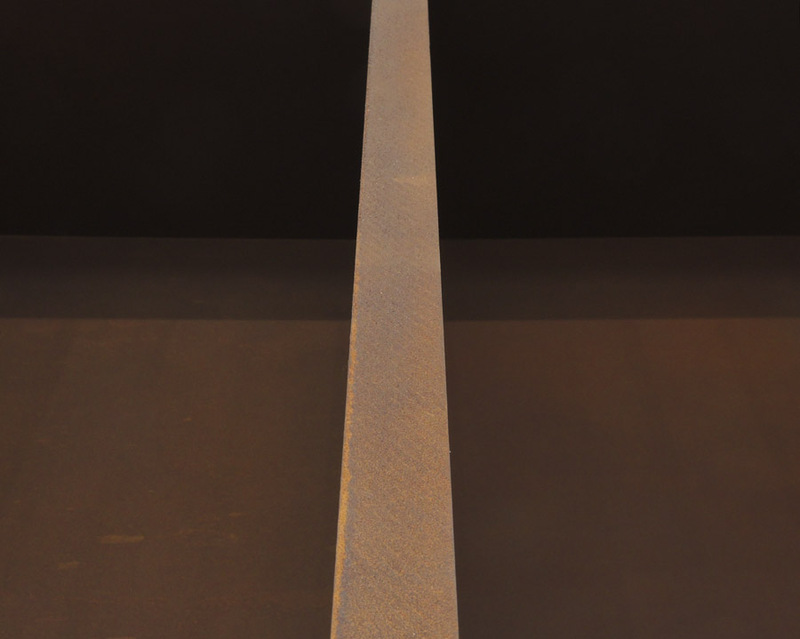 each 39 3/8 x 78 3/4 x 78 3/4 in. Also in the show are four large floor pieces, each 1 x 2 x 2 meters, each having a different division of its interior space. 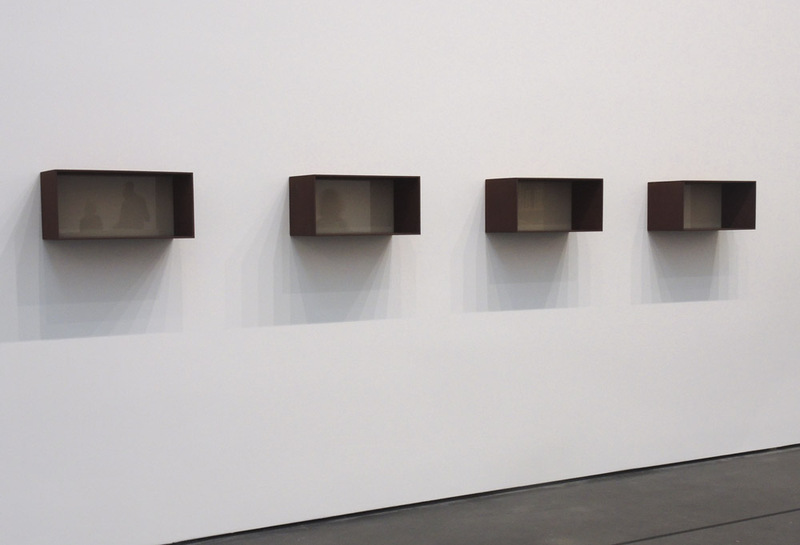 I am someone who finds it very satisfying to look down at a clear division of space within a large rectangle. 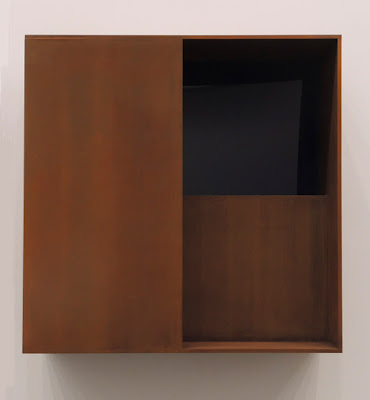 Judd managed to evoke complex feelings using basic forms. Giorgio Morandi, Natura morta (Still life), 1947; oil on canvas, 8 1/16 x 10 13/16 in. Giorgio Morandi, Natura morta (Still life), 1949; oil on canvas, 12 x 17 15/16 in. 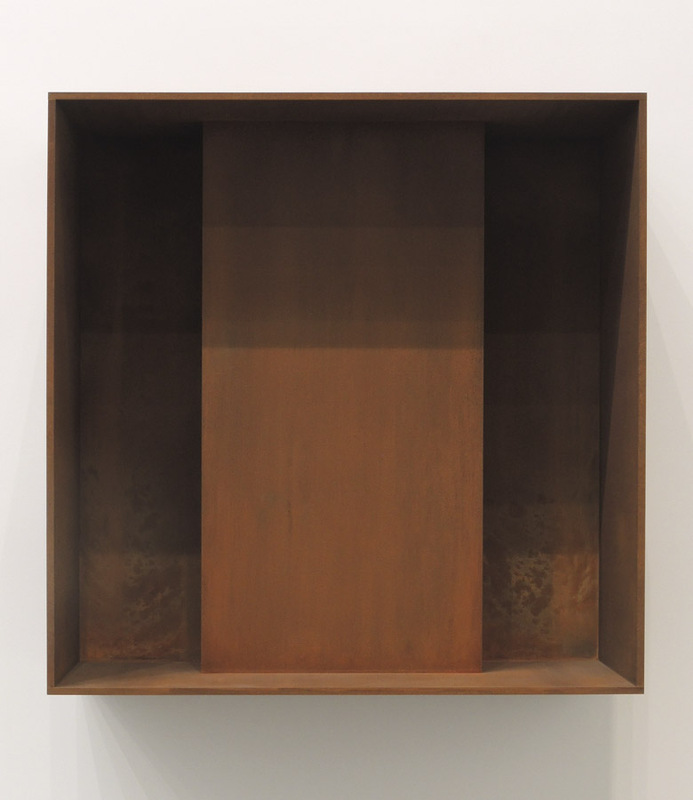 ....or compressed against its outer edge, I feel that the things depicted are more than just studio props; they become, like the Judd sculpture, essential forms, touching on transcending the ordinary. 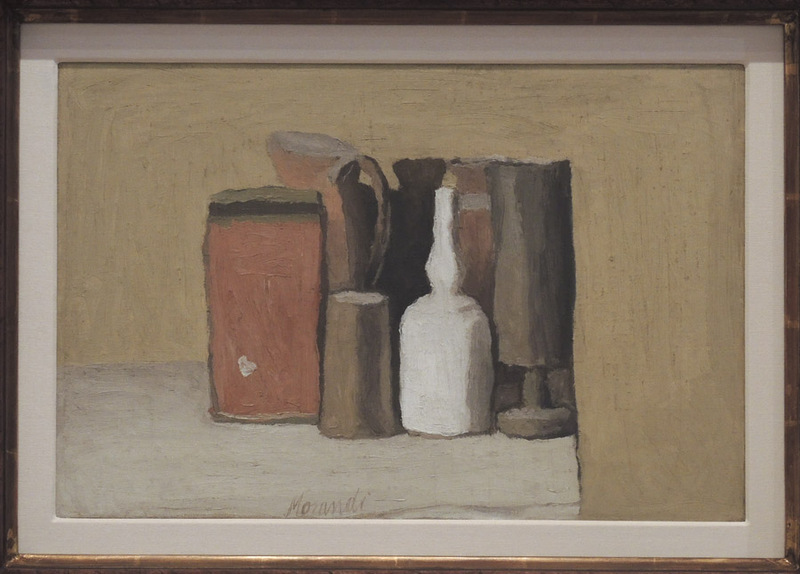 Giorgio Morandi, Natura morta (Still life); oil on canvas, 12 15/16 x 15 13/16 in. 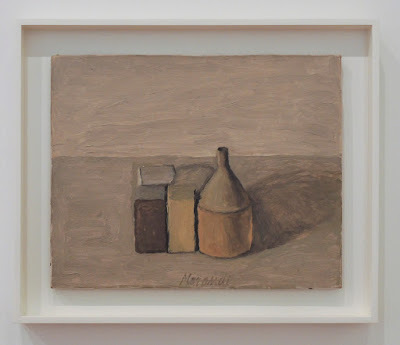 Morandi searched for underlying reality through perception, trying to understand shape, color, space, using his hand, while Judd's search used geometry and manufacturing. Giorgio Morandi, Natura morta (Still life), 1962; oil on canvas, 12 3/16 x 14 3/16 in. But both artists explored elemental relationships of form, and through variations in those relationships, sought a kind of perfection. For me, both paths are deeply moving. 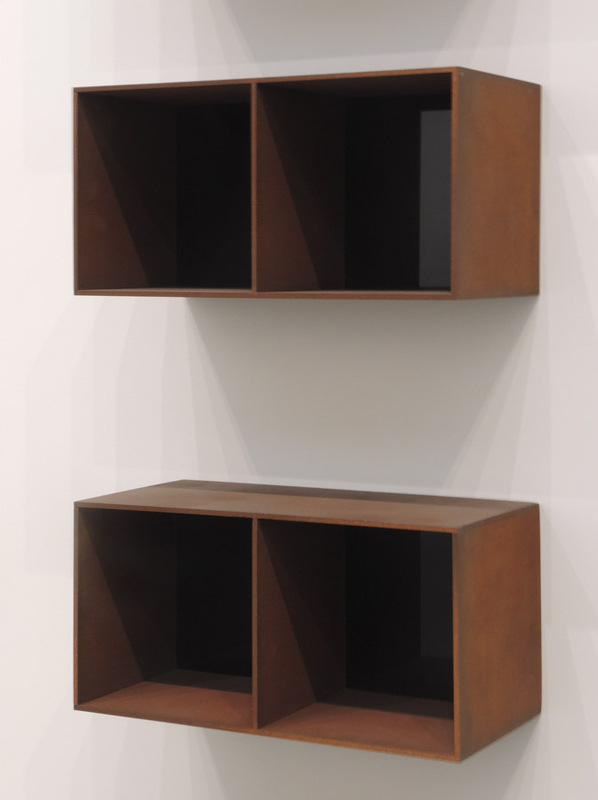 The Judd works are fantastic - though perhaps nighting lightmares. Thanks for sharing this post, I can see why you were so moved. Thank you, all, so much for reading, and for the kind comments. 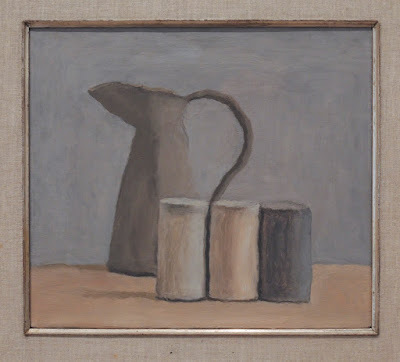 I saw the two shows but in reverse order, first the Morandi and then, the Judd. I felt a bit dumbstruck so I am grateful that you have been able to articulate what I, too, felt on seeing the Judd's. Thanks. 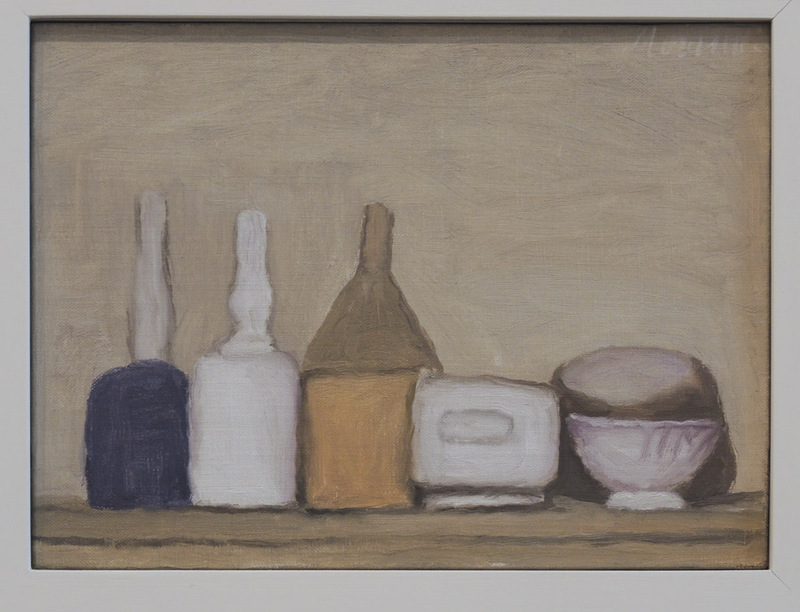 Thanks again, for looking and commenting. A New Painting: "Black Curve"